Thanks to Obamacare, all Americans will now have to submit their health insurance information to the Internal Revenue Service (IRS). Sadly, this new requirement comes at the same time that serious questions have been raised about the IRS’s ability to manage personal health records competently. An unnamed health care provider in California is suing the IRS and 15 unnamed agents, alleging that they improperly seized some 60 million medical records of 10 million Americans, including medical records of all California state judges, on March 11, 2011. The alleged data seizure occurred at roughly the same time in which employees in another division of the IRS targeted tea party and other conservative groups due to their political beliefs. If true, these new allegations regarding seized medical records would further undermine trust in the IRS’s ability to conduct its affairs properly and to manage the sensitive and confidential information all Americans submit to the agency every year. As this week’s entire series has shown, the IRS’s reach within Obamacare seemingly knows no bounds. Armed with new bureaucrats and funded by a massive spending blitz, the IRS will implement trillions of dollars in tax increases; issue new regulations, edicts, and orders; impose new paperwork burdens on all Americans; and increase the scope of government intrusion into the lives of ordinary, law-abiding citizens. Prior to the recent scandals, many Americans thought the IRS could not be trusted to implement Obamacare in a competent and impartial manner. Now they know it. It’s one more reason why Congress should repeal Obamacare once and for all. Of all the provisions in Obamacare the Internal Revenue Service (IRS) oversees, the most far-reaching is the mandate for all Americans to purchase government-approved health insurance. Unprecedented in its scope—forcing all Americans to buy a product, and taxing them due to their very existence if they do not—the mandate will require Americans to submit their insurance information to the IRS. Section 1502 of Obamacare includes pages of requirements that insurers will have to submit to the IRS documenting people’s health coverage, including individuals’ names, Social Security numbers, whether or not the health plan is “government-approved” coverage complying with the mandate, and “such other information as the [Treasury] Secretary (i.e., the IRS) may require.” Individuals will also get copies of these forms, and have to submit them to the government with their tax returns. A new three-page schedule had to be completed and filed with…the state tax return. In addition, a 10-page booklet with instructions and worksheets accompanies the other instructions and worksheets for the state income tax return. If the IRS mandate form is three pages long, it will be longer than form 1040, which most Americans use to file their taxes. Individuals and businesses spend about 6.1 billion hours a year complying with the filing requirements of the Internal Revenue code. If tax compliance were an industry, it would be one of the largest in the United States. To consume 6.1 billion hours, the “tax industry” requires the equivalent of more than three million full-time workers. Given the onerous paperwork burdens our country already faces thanks to the tax code, Americans do not need or want to face more bureaucratic hassles to provide personal health information to the IRS. [The projected premium rates] are low enough that you have to think, are there going to be health plans in this market that are underwater…. It’s so hard to predict because you don’t know who’s going to show up on the market. The administration had predicted that up to 400,000 people would enroll in the program, created by the 2010 health care law. In fact, about 135,000 have enrolled, but the cost of their claims has far exceeded White House estimates, exhausting most of the $5 billion provided by Congress…. People in the pre-existing condition program have been much sicker than actuaries predicted at the time the law passed. If that phenomenon repeats itself in the exchanges—either because only sick individuals enroll, or because employers struggling with high health costs dump their workers into the exchanges—premiums will rise significantly in future years. Covered California, the state-run health insurance exchange, yesterday heralded a conclusion that individual health insurance premiums in 2014 may be less than they are today. Covered California predicted that rates for individuals in 2014 will range from 2 percent above to 29 percent below average small employer premiums this year. Therein lies one of Obamacare’s many flaws. Liberals now argue that while some may pay more for coverage, they will get “better” benefits in return. However, when campaigning in 2008, then-Senator Barack Obama didn’t say he would raise premiums; he said he would give Americans better coverage: He promised repeatedly that he would cut premiums by an average of $2,500 per family. That gap between Obamacare’s rhetoric and its reality makes arguments such as Krugman’s seem fanciful by comparison. The many federal bureaucrats working on Obamacare implementation within the IRS stand at the center of an intricate web of government and regulation that will ensnare all Americans in its grasp. The Government Accountability Office (GAO) last year released a report with a chart showing all the bureaucratic offices and divisions within the IRS charged with carrying out Obamacare. Nowhere in the chart do the words doctor or patient appear—as clear a sign as any that Obamacare is not about health care; it’s about government power. And heading up this entire effort has been Sarah Hall Ingram, the same official previously in charge of the IRS unit that subjected conservative groups to additional scrutiny for their political beliefs. The Internal Revenue Services’ implementation of [Obamacare] is a massive undertaking that involves 47 separate statutory provisions and extensive coordination across not only IRS, but multiple agencies and external partners. For example, IRS must coordinate with other federal agencies and states in providing assistance to qualifying individuals for health insurance premiums. Getting the Obamacare “train wreck” up and running will cost the Internal Revenue Service (IRS) an estimated $881 million between 2010 and 2013, according to the Government Accountability Office. As of last June, the IRS had already requested more than half a billion dollars from an implementation “slush fund” established in Obamacare. This gusher of new spending will continue even after Obamacare is up and running. In its budget submission this year, the IRS requested even more spending—a whopping $439.6 million—and 1,954 new employees. This ongoing spending—over $1 billion in just the law’s first four years—only adds to the trillions in new entitlement programs created by the law. It’s one more reason Obamacare is unaffordable—for the taxpayers forced to fund it, and forced to live under new IRS mandates, edicts, and regulations. As we’ve previously noted, Obamacare includes no fewer than 18 separate tax increases, raising at least $1 trillion in the law’s first 10 years alone. Worse yet, the IRS will need to spend billions of dollars of taxpayers’ hard-earned money to take these trillions in new revenues from taxpayers. With the IRS under fire for its improper targeting of tea party groups, many Americans have also raised concerns about the agency’s activities relating to Obamacare. This week, we’ll be taking a look at just some of the many ways in which the IRS will be intimately involved with implementing the massive law. Obamacare taxes most people with health insurance, and most people without health insurance. Likewise, the law taxes many employers who provide health insurance, and most employers who don’t provide health insurance. Obamacare contains no fewer than 18 tax increases. What’s more, 12 of these taxes will be borne by the middle class, directly breaking President Obama’s 2008 “firm pledge” to those making under $250,000 per year that he would not “raise any of your taxes.” For instance, many seniors will end up paying the 2.3 percent tax on medical devices as the price of wheelchairs, defibrillators, and other needed medical equipment will rise. Here’s a list of all the Obamacare taxes to be administered by the IRS. A backroom deal made during the writing of Obamacare will harm seniors and the poor, according to The Wall Street Journal (WSJ). During their closed-room dealings with the Obama Administration, the hospital industry’s lobbyists agreed to support Obamacare—provided that the law placed restrictions on physician-owned “specialty” hospitals, noted WSJ. These innovative specialty hospitals frequently have quality outcomes better than most traditional facilities, but no matter—the big hospital lobbyists wanted to eliminate a source of competition. So Obamacare prohibits new physician-owned hospitals from receiving Medicare payments — and prohibits most existing facilities from expanding if they wish to keep treating Medicare patients. Forest Park Medical Center in Dallas has stopped accepting Medicare patients, allowing it to escape the law’s restrictions entirely…. Rejecting Medicare ‘was a big leap, but we felt like the law gave us no choice,’ said J. Robert Wyatt, a Forest Park founder…. Other doctor-owned facilities are asking the federal government to let them duck the law’s restrictions altogether. Doctors Hospital at Renaissance near McAllen, Texas, is trying to get a waiver allowing it to expand as more than 53% of its payments come through the Medicaid federal-state insurance program for the poor. Any effort to undo the expansion limits faces an uphill battle with Democrats, because the restrictions were a deal-breaker for hospitals when the White House sought their support for the law in 2009, industry lobbyists say. Obamacare’s backroom deals (the “Louisiana Purchase,” the “Gator Aid,” and the “Cornhusker Kickback”) represented the worst in politics—well-heeled lobbyists seeking to obtain government largesse through pork-barrel spending and regulatory loopholes. The Wall Street Journal story reminds us how those backroom deals have real-world consequences when it comes to medical access—another example of how Obamacare has harmed patient care. This Issue Brief is available at the Heritage Foundation website. The recent admission by the IRS that its employees improperly subjected certain organizations to heightened scrutiny based upon their political affiliation raises troubling questions about the agency’s ability to manage Obamacare in a competent and impartial manner. At a time when doubts are growing about the IRS’s politically biased behavior, Obamacare grants the agency massive new authority to implement its complex and bureaucratic regime. 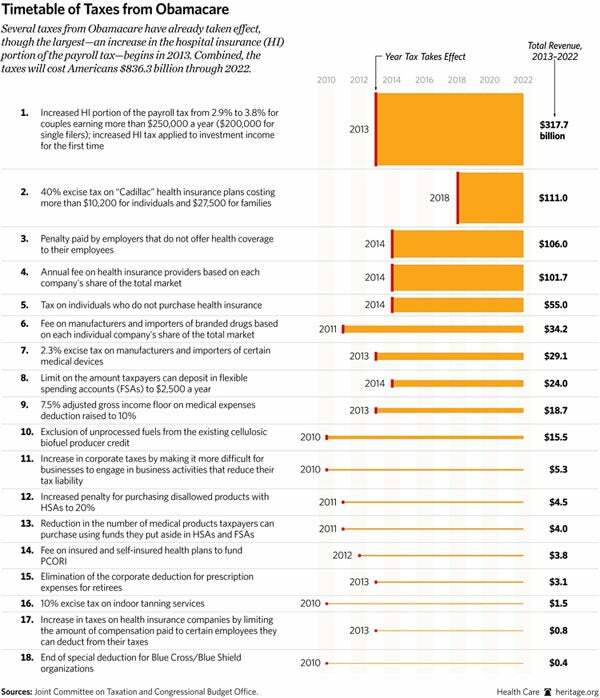 Obamacare contains no fewer than 18 tax increases, including new taxes on medical devices, insurers, and pharmaceutical companies, to name but a few. According to the most recent estimates, those tax increases will raise revenue by at least $1 trillion over the next 10 years—followed by higher sums in future decades. Treasury Secretary Jack Lew recently testified before Congress that the IRS had approximately 700 full-time equivalent staff working on Obamacare implementation. However, in its budget request this spring, the IRS assumed that a force nearly three times that size—1,954 full-time equivalent employees—would work on the law’s implementation in the coming fiscal year. Obamacare requires all insurance companies to report to the IRS the name, address, identification number, and type of policy purchased by every customer, along with a determination whether the insurance was “government-approved” for purposes of complying with Obamacare’s individual mandate. Likewise, individuals will have to file similar forms demonstrating they held “government-approved insurance” with their tax returns. At a time when the IRS will receive massive new amounts of personal health information from virtually all Americans, the agency’s ability to manage the health records it already receives has come under scrutiny. The American Enterprise Institute’s Scott Gottlieb writes that “an unnamed healthcare provider in California is suing the IRS and 15 unnamed agents, alleging that they improperly seized some 60 million medical records of 10 million Americans, including medical records of all California state judges on March 11, 2011.” These allegations raise additional concerns about the IRS’s competence to manage the confidential health details of millions of American citizens. Both the IRS scandal and Obamacare contain similar themes: government overreach, massive intrusions, and bureaucrats granted opportunities to abuse their power in arbitrary and harmful ways. The American people should not be subjected to either. Alyene Senger and John Fleming, “Obamacare’s 18 New Tax Hikes,” The Heritage Foundation, The Foundry, August 20, 2012, http://blog.heritage.org/2012/08/20/obamacares-18-new-tax-hikes/. Congressional Budget Office, cost estimate for H.R. 6079, Repeal of Obamacare Act, July 24, 2012, http://cbo.gov/sites/default/files/cbofiles/attachments/43471-hr6079.pdf (accessed May 16, 2013). Barack Obama, speech in Dover, New Hampshire, September 12, 2008, http://www.youtube.com/watch?v=6HE-rGGKksQ (accessed May 16, 2013). Government Accountability Office, Patient Protection and Affordable Care Act: IRS Managing Implementation Risks, but Its Approach Could Be Refined, GAO–12–690, June 13, 2012, pp. 1 and 5, http://gao.gov/assets/600/591566.pdf (accessed May 16, 2013). Cited in letter by Representative Charles Boustany (R–LA) to Acting IRS Commissioner Steven Miller, March 21, 2013, http://waysandmeans.house.gov/uploadedfiles/irs_aca_resources.pdf (accessed May 16, 2013). Internal Revenue Service, Fiscal Year 2014 Budget Justification, p. 169, http://www.treasury.gov/about/budget-performance/CJ14/10.%20IRS%20CJ%20FINAL%20v2.pdf (accessed May 16, 2013). Treasury Inspector General for Tax Administration, “The Modernization and Information Technology Services Organization Is Effectively Planning for the Implementation of the Affordable Care Act,” September 19, 2011, p. 1, http://www.treasury.gov/tigta/auditreports/2011reports/201120105fr.pdf (accessed May 16, 2013). Government Accountability Office, Patient Protection and Affordable Care Act: IRS Should Expand Its Strategic Approach to Implementation, GAO–11–179, June 2011, p. 2, http://www.gao.gov/new.items/d11719.pdf (accessed May 16, 2013). National Taxpayer Advocate, “Report to Congress: Fiscal Year 2011 Objectives,” June 30, 2010, p. 9, http://www.irs.gov/pub/irs-utl/nta2011objectivesfinal..pdf (accessed May 16, 2013). Patient Protection and Affordable Care Act, Public Law 110–148, Section 1502. Scott Gottlieb, “Suit Alleges IRS Improperly Seized 60 Million Personal Medical Records,” Forbes, May 15, 2013, http://www.forbes.com/sites/scottgottlieb/2013/05/15/the-irs-raids-60-million-personal-medical-records/ (accessed May 16, 2013). Members of the House of Representatives are scheduled to vote Thursday to repeal all of Obamacare. Given that the House voted to repeal the law last year, some commentators and observers have questioned the need for another repeal vote. However, the scandals coming to light over the last week perfectly make the case for why Congress must eradicate the law from the statute books. On Friday, the Internal Revenue Service finally disclosed that it had spent years targeting Tea Party and other conservative groups, delaying their applications for non-profit status and giving those applications additional scrutiny — solely because of those groups’ political beliefs. Also on Friday, the Washington Post revealed that Health and Human Services Secretary Kathleen Sebelius personally asked health industry groups to contribute to Enroll America, a pro-Obamacare front group working to “educate” the public about the law’s supposed benefits. While we don’t yet know all the details about these scandals, we do know that the IRS grossly abused its power at a time when Obamacare grants it massive new authority. The Treasury Department’s Inspector General has said Obamacare represents “the largest set of tax law changes in 20 years,” with at least 42 provisions adding to or amending the tax code. Obamacare’s heavy reliance on the IRS seems somehow fitting, as the entire law relies on a scheme of government controls and regulations to work its will on the health care system. The law imposes price controls on insurance companies and extends a system of price controls for pharmaceutical companies. Obamacare also places a board of unelected, unaccountable bureaucrats at the center of its plans to control health care costs. That’s what Obamacare is about. It’s not about health care. It’s about government control and power. And the record of this administration shows its willingness to use this power in arbitrary and harmful ways. Secretary Sebelius’ recently disclosed fundraising campaign tried to make an end-run around Congress, forcing private companies to give money for a pro-Obamacare marketing campaign that Congress itself has refused to fund. It isn’t the first time the secretary has skirted the law, either. HHS’ infamous waivers, the majority of which went to individuals in union health plans, weren’t mentioned in Obamacare. And in recent weeks, Democrats who support the law have criticized the secretary for taking funds from other programs to fund Obamacare implementation. Just like the IRS, HHS has also targeted the First Amendment rights of private organizations. In 2009, the department applied an infamous “gag order” on Medicare Advantage plans, ordering them not to communicate with seniors about how Obamacare’s cuts to Medicare Advantage would affect their coverage. If past experience is any guide, IRS and HHS could use their newfound Obamacare powers to target their political opponents. Will individuals who choose not to buy insurance under Obamacare’s mandate find themselves subjected to government audits? There’s one easy way to stop the rot, and that’s to repeal Obamacare once and for all. At a time when this week’s revelations show how the government has abused its existing powers, it’s exactly the wrong time to give the government yet more authority. Congress should instead focus on repealing Obamacare and restoring freedom. This post was originally published in The Washington Examiner. 1) Obamacare is a federal program, not confined to one state. The PriceWaterhouseCoopers study equates changes made in one state to a law affecting all 50 states, and assumes that employers around the country will respond in more or less the same ways. However, that assumption falls short. When Massachusetts passed its reforms in 2006, national employers, such as General Motors or Walmart, were not allowed to drop their health plans in Massachusetts alone, while still providing coverage for their workers in the 49 other states. Now, if they so choose, they can shed their employee health benefit obligations in all 50 states, and the workers will be covered under Obamacare. In the Commonwealth, if an individual is offered employer insurance, they [sic] cannot access the exchange or subsidies, period. The only way around this firewall is for the company to drop coverage altogether, and for employees to go uncovered for six months before they can access subsidized coverage. This is highly unlikely given the industry mix in the state. Conversely, under Obamacare, employers can stop offering insurance at any time, and their workers will become immediately eligible for income-based insurance subsidies. 3) Obamacare subsidizes more individuals than the Massachusetts plan. While Massachusetts’s law subsidizes health insurance for families with incomes of less than three times the federal poverty level (FPL), Obamacare grants subsidies up to four times the FPL. According to the Census Bureau, in 2011, 133.9 million non-elderly Americans lived in households with incomes less than three times the FPL, but 169.2 million non-elderly Americans lived in households with incomes less than four times the FPL. In other words, more than 35 million more Americans will be eligible for income-based subsidies under Obamacare than if the Massachusetts law were extended nationwide. That fact—that more than three in five Americans will qualify for taxpayer-funded health subsidies based on their income—will only encourage employers to drop health benefits, because the majority of their workers can obtain new federally funded insurance instead. The PriceWaterhouseCoopers study also argues that the existing tax benefits provided to highly paid employees—those individuals not eligible for Obamacare subsidies—will encourage firms to keep offering health coverage under Obamacare. However, as economist Doug Holtz-Eakin has argued, if employers restructure their businesses to drop insurance for low-income and middle-income workers, the costs to the federal government will explode. The case against the recent PriceWaterhouseCoopers study can best be expressed by a 2011 survey of large employers, which found that nearly half of all employers surveyed were very or somewhat likely to “significantly change/eliminate subsidies for employee medical coverage.” Which organization happened to sponsor that survey? None other than PriceWaterhouseCoopers.